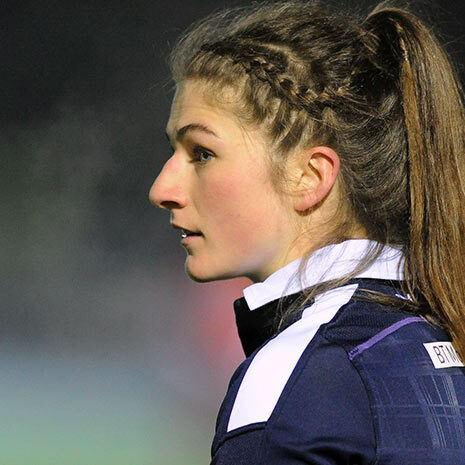 The team at rugbystore has teamed up with esteemed Chartered Physiotherapist, Neil Aitken to give you high quality information on the most common Rugby injuries and how to best recover from them. 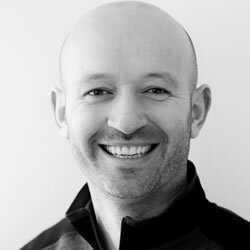 If there’s a particular injury you’d like us to cover with Neil’s help, get in touch with us on social media (Facebook | Twitter). If treated correctly, you should recover from a sprained ankle fully, without being at a higher risk of sustaining the same injury again. However, if you simply rest the ankle until the pain has eased and then return to training, research shows that you are more susceptible to injuring the ankle again. Many sports people have to strap their ankles for every training session and match. This is due to the long-standing instability of their ankle, often because they have not gone through a proper rehabilitation program. The most common is the anterior talofibular ligament which is found just in front of the ankle bone (fibula) on the outside of your ankle. If the injury is slightly more severe, you may also strain the calcaneofibular ligament which you will find directly below your ankle bone. Typically, you can tell which ligaments are injured by pressing on each one with your fingertip. So feel the area in front of the tip of the ankle bone and also below it to see if one or two of the ligaments are possibly injured. 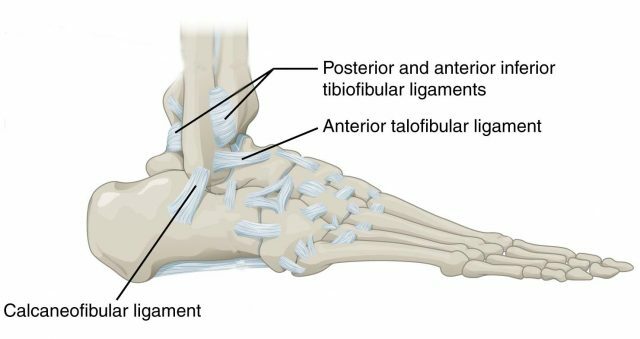 The third ligament is the posterior talofibular ligament and is much less likely to be injured. This can be found just behind the ankle bone. The other factor which will impact on the severity of the injury is the grade of the ligament strain – graded from 1 to 3 depending on the amount of damage or the number of ligaments which have sustained damage. Grade 1 Ankle Sprain: Mild damage to a ligament or ligaments without instability of the joint. Grade 2 Ankle Sprain: Partial tear to a ligament, in which it is stretched to the point that it becomes loose. Grade 3 Ankle Sprain: Complete tear of a ligament, causing instability in the joint. 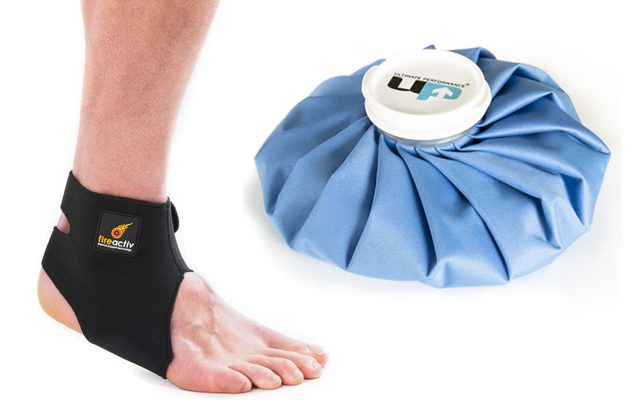 Protection: Best performed with an ankle brace rather than a simple tubigrip. Rest: Prevents further bleeding and irritation of the ligament. Ice: Apply ice to the injured ankle for 20 mins every 2 hours. Compression: Helps to limit ankle swelling. Elevation: Also helps with swelling. Research shows that to be truly effective, elevation needs to be at 60 degrees above heart level – make sure to lie on your back with the leg well elevated. It is now widely thought that it is actually best not to take anti-inflammatories straight after the injury. This is because there are important chemicals found within the natural inflammation that are necessary to the healing process. If your ankle is still very swollen 3-4 days after the injury, this may be the time to start to use anti-inflammatories, but always check with your GP regarding medication. During recovery, it is extremely important to maintain the mobility of your ankle. Recovery is shown to be better if you keep your ankle moving as pain allows. Some discomfort is okay as long as it is not too sore. As pain settles at around the 1-2 week mark, you may be able to start strengthening the ankle and working on the balance mechanism that is so important for ankle stability. 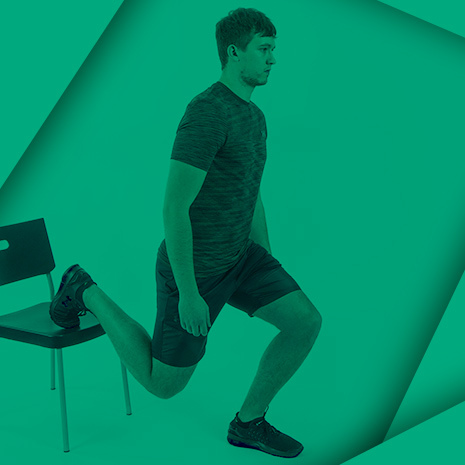 The areas to strengthen are the calf and the peroneal muscles. Strengthen your calf by performing heel raises off a step or by walking around on your toes. As a guide, an active person should be able to perform roughly 40 single leg heel raises before the calf fatigues. You can strengthen your peroneal muscles using a resistance band around the front of your foot, providing resistance against you scooping the foot towards the outside (the opposite direction to the way you injured it). This is called eversion and it is this group of muscles that provide extra stability to the outside of your ankle. Balance exercises can also be started at this stage, initially on one leg with your eyes open and then with them closed. You can also balance on an unstable surface such as a pillow, wobble board or trampoline. Once pain has resolved with day to day activities, you can try impact exercises such as hopping and other forms of plyometric exercises. If these do not cause pain or swelling, then it is okay to jog. Increase speed and introduce changes of direction if the ankle is feeling okay. Look out for any pain or swelling after exercise or the following morning. This is a sign that you may have to take a step back in your rehab. 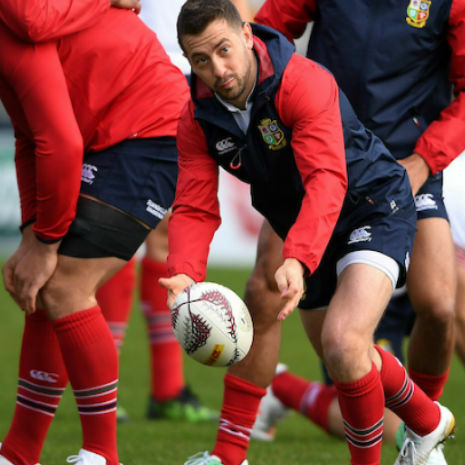 If it is feeling okay, it is at this stage that you could return to rugby training although you may still choose to wear an ankle support for the first few sessions. Try not to rely on this for too long though as it is better to expose the ankle to the stress and strain of training as this strengthens it further and is a factor in preventing recurrence. Soft tissue healing for a ligament strain typically takes 3-6 weeks depending on the severity of the strain. A more severe strain will take much longer and it may be several months before a player can return to training/playing.